A home run is perfect. A home run is a gift. A home run is history. And sometimes history picks you. Sitting in the Red Sox bullpen just beyond the right-center field wall, Delcarmen leaped into the air to catch the ball. He returned it to Nava. Matcovitch recounts, "I stood by the railing near section 132 in left field when Gary Sheffield stepped to the plate. ... It was such a blast that at first I lost the ball due to the stands above, but then as it descended I was shocked as it came towards me. It first hit off a guy's hand in the last row of seats and then floated gently into my hands." "I was thinking, 'Just don't drop it,'" Matcovich said. "That's basically what went through my mind. If I dropped it, I would have been so disappointed in myself for the rest of my life." "We walked around the stadium and found security to tell them that I had the ball in my pocket. From there my friends and I were escorted to the security office, where Major League Baseball officials authenticated the ball." Mets teammates braced Sheffield for what might be a costly purchase. "Couple guys on the team kept saying, 'It's going to cost you about $100,000 to get that ball back. I was like, 'I don't think my wife's going to let me.'" Matcovich wanted to simply return the ball to Sheffield. "I wanted nothing but to just give it back to Gary," Matcovich said. "It was his ball. It's not mine." "That was special of him to do that," Sheffield said. "He didn't have to do that. But I'm appreciative that he did." Sheffield went a step further and signed jerseys for Matcovich and his friends, with plans to also give the group some signed bats. Matcovich was invited back to throw out the first pitch and watch batting practice from the field. Scherer, a season ticket holder, wore a giveaway Sergio Mitre jersey. He "had a hunch" Griffey would pull one to right field. "As soon as the ball was hit, I got a good read on it and had to move only about five empty seats to my left. I reached up with my left arm and made a clean catch in my glove. The ball went directly from Griffey's bat to my glove. I am the only fan who touched the ball, and I never lost possession of it." Scherer's catch can be clearly seen in the video footage. Scherer had another ball with him from batting practice and pointed to it underneath one of the seats, sparking a scrum between people duped into believing that was the real No. 600. With the real ball in hand, he quietly passed out of the mob scene. Scherer refused to identify himself and refused to speak to the media. He was escorted to the ground floor of Dolphin Stadium and put the ball in one of the executive offices. Reds media relations director Rob Butcher and Reds clubhouse manager Rick Stowe told the fan that Griffey would like the ball. Scherer replied, "Before you go any further, because of my circumstances, I'm keeping it. I have plans for it." "Different people do different things," Griffey said. "I'd like it. I can't control it. The guy has it. I'll worry about it later." Marlins president David Samson gave him his personal phone number and told him to sleep on his decision. Speaking on Scherer's behalf, Samson said his name was Joe, was in his mid-40s, and had been a season-ticket holder since 1993. Samson said he had met him at a few of the Marlins' events. "He's a Marlins fan, he recognizes the importance of the ball, and he recognizes the importance that it would have to Ken, who he called a class act and a first-rate player," Samson said. "He's going to call me [on Tuesday]. We're going to talk about the ball and what the best course of action is for it." Justin Kimball, a 25-year-old from Miami, told reporters he was the one who caught the home run ball but had it ripped from his hands. "It corroborates it on video evidence that I caught the ball, and I have a bunch of people here saying I caught the ball," said Kimball, pointing to scratches on his leg and arm. "I reached, I caught it, I brought it back and the guy just ripped it out of my hands." But video evidence showed a man in a Florida jersey catching the ball, and Samson said it was clear that man was Scherer. Eventually, Major League baseball authenticated the home run ball for Scherer. In June 2008, Scherer announced he would auction the ball, stating that he needs the money. Griffey suggested that he think about it very carefully. "It's his choice. I'd like to have it, but it is what it is," said Griffey. When Griffey's agent, Brian Goldberg, was asked about Scherer, he said, "He's got to separate fantasy from reality. ... I don't think the dollar value is going to be anything close to what Joe thinks. This ball didn't break any records and it's not unique." Through the Marlins' front office, Griffey passed along an offer to Scherer for the return of the ball. It included 10 Griffey memorabilia items, including some game-used articles, items that came from other players, and an all-expense paid trip for four people to New York for the All-Star break, including tickets the All-Star Game and Home Run Derby. But Scherer declined. Scherer used Mastro Auctions to sell the ball for $42,000 in August 2008. "I'm going to catch Manny's 500th home run tonight," the Woo said over the phone the day before playing a round of golf at Andrews Air Force Base with his brother, Jason. Woo had promised his girlfriend's son, Ryan McCarthy, that if he caught Ramirez' historic home run the ball, it would go to the then-15-year-old. Sitting in Section 94, seats 15 and 16, Woo pulled out his camera when Manny Ramirez stepped to the plate in the top of the seventh inning. "As soon as I hit it, I knew it was gone," Ramirez said. At 9:29 p.m. the specially-labeled ball, identified as ball No. 92, was flying straight towards the Woo brothers. Damon snapped a quick picture before stuffing his camera into his pocket and bracing for the impact of the ball. "I have never seen a ball look so big," Jason remembered. Damon lunged forward slightly, positioning himself such that the ball hit him in the neck, where he trapped with his right hand. The Red Sox fan, wearing his bright red t-shirt, quickly took off his blue Sox hat, stuffed the ball into it and proceeded to place both in his pocket. Jason covered him until Baltimore police made their way to their seats and escorted the two to the Red Sox clubhouse. "Nobody was going to take it away from us," said Damon. After being ushered away by security and into the Red Sox clubhouse, Damon called McCarthy to let him know that he had, indeed, caught Ramirez' home run and now needed marching orders to know what to do with it. McCarthy gave Woo and his brother permission to hand the ball over to Ramirez. Presented the ball to a grateful Ramirez, Woo said "Congratulations, you got 500. It's all yours." "It belongs to [Ramirez]," said Woo. "It's his accomplishment. It's his achievement. It's his ball. He said I could borrow it for the night, but it's his. That's the right thing to do." Woo received equipment and memorabilia from Ramirez and some game tickets from the Boston Red Sox. "They are so nice, and I'm just happy to have the ball," Ramirez said. "What I want to do with the ball is take some pictures with my kids," Ramirez said. "I don't want to keep the ball. I want to see how much money I get, because I want to put it toward a hospital that I'll donate money to." He planned on giving it to a local children's charity in Boston, but no such event ever took place, and it is assumed the ball is still in the possession of the player. "I like to think for the rest of my life I have a connection to Manny Ramirez," Woo said. "That sentiment will always be there. I realize the personalities play in an important role as role models for not just kids, but folks in general, but they're still human at the same time. We all make mistakes. Hopefully those numbers keep going up and I'll have a chance to catch 600 someday and 700 and see him go into the Hall of Fame." Woo has received a ton of e-mails from friends around the globe, some of whom he hasn't spoken with in a while. "As [the story] slowly circled the globe, folks I have lost touch with over the years have called or dropped me an e-mail," he said. "People have been telling me I did the right thing and I've certainly been on a high from that. ... The company I keep, [people approve by] about 98 percent. "The responses from friends has been overwhelmingly that I did the right thing. That put me on a life's high as well." Still, there's been that little devil on his shoulder telling him he should have kept the ball. "The first couple of days it hit me once an hour where I had the reflex, 'Oh, God! What did I do? I'm now happy to say it's down to about once a day." His brother would frequently call to remind him that he did the right thing. "He provided that moral support," said Woo. After the game, Zimmerman traded a signed jersey for the home run ball, which he planned to either keep at his house or give to his parents as a memento. In the days leading up to the record homer, Thome said he wanted the ball back and planned to drive with his father to deliver it to the Baseball Hall of Fame. Stewart didn't know until he got to the game that he had a chance to see baseball history. "I got to meet him.." Thome said. "He came in the following year to the Cubs and Sox series," Thome said. "He was a great guy from Dallas, a guy who flew in, was on a business trip. Really didn't even know anything about what the significance of the game was and he caught the ball. The guy was great. The guy was absolutely wonderful." Stewart chose to return the ball to Thome. In return, the White Sox offered Stewart two season tickets for the 2008 season and an autographed ball and bat. Stewart chose to donate the two season tickets to the charity of Thome's choice. They were eventually auctioned off during the Joyce Thome Benefit for the Children's Hospital of Illinois, an event named in honor of Thome's late mother. The team said they will fly Stewart out from Texas with a group of his friends to sit in Thome's box during one of the White Sox-Cubs games next season. Thome and his father visited Cooperstown to deliver his 500th home run ball to the Hall of Fame. "That wasn't a ball that I should keep, that was something the Hall should have," Thome said. "It would just be sitting on my mantle at home. Now it's something for everyone to see." The great father-son trip to Cooperstown "was really special for us," Thome said. "At the hotel [the Otesaga] there, my dad and I sat out on the terrace and they had lunch for us. They told us all the stories about the Hall of Famers. We toured the museum. I think it was the greatest days of my dad's life. And other than the birth of my children, it was the greatest day of my life." Sutton retrieved the ball in a three-man scuffle. He was never approached by an MLB official, whisked away by stadium security, or interviewed on TV. Instead, he returned to his seat, watched most of the game, and disappeared before the final out. Sutton placed the ball in a safe deposit box and tracked Bonds' stats for the remainder of the season. He knew that another home run would greatly reduce the value of his ball, but says he never rooted against Bonds. "I thought it would be cool if he could keep adding to his record, but he never did, and that's when I was like, 'Damn.'" Months after making the catch, Sutton came forward and announced that, due to a serious illness in the family, he would auction off the ball. Game footage, as well as a successful polygraph test corroborated Sutton's claim that he had the real ball. Sutton was hoping for $1 million, but it went for $376,612 with SCP Auctions. Murphy and a friend were on their way to Australia. On a one-day San Francisco stopover, they purchased game tickets on a whim at the last minute. Clad in a Mets jersey and cap, Murphy moved in the bleachers to where he thought the ball would land. When Bonds connected, "there was complete chaos," said officer Ana Morales. She said the ball "hit something, bounced up and then as it was going down toward the ground, he [Murphy] leaned over and got it." There was a massive pile of fans scrambling to get to the ball, and Murphy was on the bottom, Morales said. "It took a weird bounce and I just dove on it." He added, "I just curled under a bleacher and immediately there was a 30-person dogpile." Officers began peeling people off the top. When they got to Murphy, he was bent over and bloodied, with the ball in his hand. She told him, "Put the ball in your pocket and we will protect you." 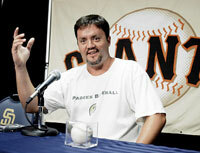 Morales and Martin led Murphy to a secure area in the ballpark and Giants officials who authenticated the baseball. "I won the lottery," Murphy told The Daily News in a story posted on its Web site Wednesday. "I'm scraped up but nothing serious." "I don't want the ball," Bonds said flatly after the milestone, adding that he hoped Murphy didn't get hurt during the ruckus. "I've never believed a home run ball belonged to the player. If he caught it, it's his." "I'm going to be smart about what I do with it," he said. Murphy said he would split any profits with the friend who went with him to the game. Murphy ultimately decided to sell the ball because he couldn't afford to pay the taxes required to keep it. It went to auction with SCP Auctions and sold for $752,467.20. The winning bidder was fashion designer Mark Ecko, who asked the public to vote on what he should do with the ball on vote756.com. "The public chose to send the ball to the Hall of Fame with an asterisk, as a constant reminder of this unforgettable moment in sports history and popular culture." Ecko continued, "You might say it's defacing. Others might say that it's validating the way most people feel about the ball." The home run ball was indeed marked with an asterisk and then donated it. Baseball Hall of Fame president Dale Petroskey said accepting the ball did not mean the Hall endorses the viewpoint that Barry Bonds used drugs. In any case, the Hall has promised Ecko that the asterisk would not be obscured. Bonds sounded off on Ecko. "He's stupid. He's an idiot. ... He spent $750,000 on the ball and that's what he's doing with it? What he's doing is stupid." The ball landed in the hands of Kowalczyk, a lifelong Yankee fan who had emptied his bank account to buy season tickets. After the 6'4" Kowalczyk caught the ball, he used his roughly 250-pound frame to protect his prize from a scrum of crazed fans Saturday. Kowalczyk was in fetal position by the time police pulled other fans scrambling for the ball off him. He was retrieved by stadium security guards who took him to a suite to watch the rest of the game and then drove him home. Rodriguez said that he would, of course, like it back. "I'm kind of just going to let it sit for a few days," Rodriguez said. "It's his ball. Let him enjoy it and then go from there." He and the Yankees attempted to purchase the ball from Kowalczyk, but a deal was apparently never consummated. In February 2010, SCP Auctions sold the ball for $103,579. Immediately after catching the ball, security brought Hughes to a location where MLB officials could authenticate and tag the ball. "I'm really happy for Bonds," said Hughes. "He made a lifetime achievement and I feel very fortunate that I caught this ball. Never in a million years did I expect it." After weighing his options for a week, Hughes decided to sell the ball. It was sold by SCP Auctions for $186,750. Hughes said he expected to share the money with a cousin who attended the game with him last weekend. He will pay off some debts, donate to charity, and "sock away" whatever is left.